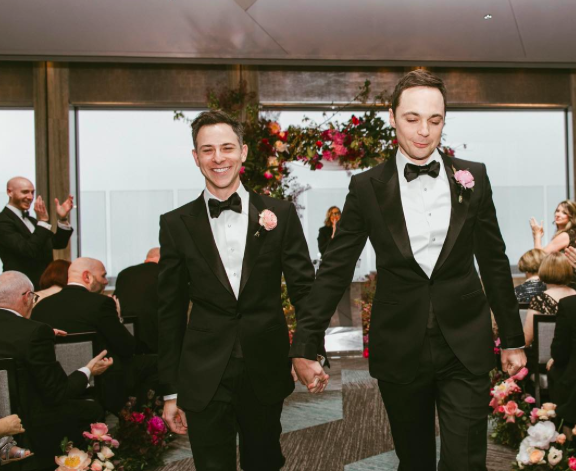 Jim Parsons, mostly known for his role as Sheldon Cooper on the CBS sitcom “The Big Bang Theory,” married his partner of 14 years over the weekend in New York. The Emmy-award winning actor, 44, came out in a 2012 New York Times interview that discussed his role in a Broadway play called “The Normal Heart,” which focused on the AIDS epidemic of gay men in New York around the 1980s. He also confessed to being in a 10-year relationship at the time of the interview with his graphic designer boo, Todd Spiewak, who he met during a blind date at a karaoke bar in 2002. The two made their first red carpet appearance together in 2013 at the GLSEN Respect Awards and have not been shy to show their love ever since. In recent years, Parsons stated they were in no rush to get married, but the couple finally decided to tie the knot at the Rainbow Room in New York City on Saturday. Parsons shared a few photos from the beautiful wedding (taken by Amber Gress Photography) on his Instagram (@therealjimparsons). Congratulations to the happy newlyweds! !